Since the breakdown of infrastructure as a result of the 2011 revolution, young people in Egypt face high levels of unemployment and increasing costs of living. The number of people struggling to provide income for themselves and their families was recognised by our partner, John Hanna. John stressed the need to support young people in accessing small business loans and mentoring opportunities. Our partnership with John enabled us to develop a micro-finance project for young people and people with disabilities. In 2013 we raised funds to provide 80 carefully selected individuals with loans to establish small businesses, and recruited volunteer business mentors. Hany Fayez is a 35 year-old man who has a sight problem. Hany and his brother wanted to start up a project of selling shoes, but they didn’t have enough money to start. When Hany heard about the microfinance programme, he submitted an application to get a loan. 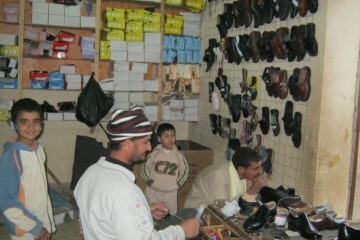 This was granted, and the Fayez brothers started buying old shoes, mending them and selling them at local markets. After completing the repayment of the first loan, they applied for a second, bigger loan to use as capital to expand the business. With the income they generated from this, they were able to pay off the second loan. Hany was able to build a house, and he says he is happy because he has enough rooms and it is suitable for him and his sons to live. Hany is also able to pay for his children’s school fees now.